A TEAM of NHS foot care experts working across southern Derbyshire, Amber Valley and Erewash donated over 100 pairs of new socks for people attending the Padley Centre in Derby city centre over Christmas. The idea came from podiatrist Amanda Scotland and podiatry assistant Amanda Holler, who run a regular clinic session every eight weeks at the Padley Centre to offer foot care to homeless people. 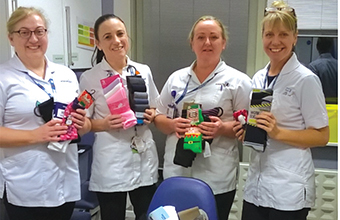 Their podiatry colleagues at Derbyshire Community Health Services NHS Foundation Trust quickly adopted the idea as their Christmas charity and bought new socks to add to the bumper selection, with a final tally of 108 pairs donated. Pictured with the sock collection are (from left) community podiatrist Karen Eason, podiatry assistant Amanda Holler, community podiatrists Amanda Scotland and Claire Slee. 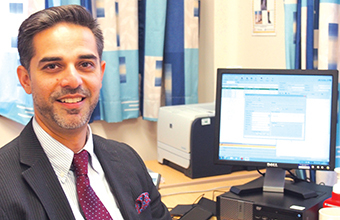 Mustafa Javed is no stranger to Scunthorpe hospital having walked the wards when he accepted his first ever surgical junior doctor post here. Mustafa completed his Certificates of Completion of Training from the Yorkshire Deanery. He has since been all over the world with a Trauma Fellowship in Hungary and back to the UK for Upper Limb Fellowships in Cardiff and Chesterfield. 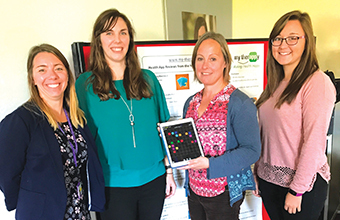 Alongside organisations including Northern Devon Healthcare NHS Trust and Livewell Southwest, students are clinically testing apps to see if they are suitable to be part of the mytherappy website - a database of clinically recommended health apps developed by the stroke and neuro rehab team at NDHT. Pictured are Ruth Siewruk, NDHT; Louise Holmes, Kim Algie, MSc Advanced Professional Practice Neurological Rehabilitation; and Sophie Maynard, BSc Occupational Therapy. 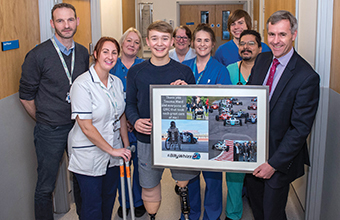 TEENAGE racing driver Billy Monger has fulfilled a remarkable promise to return and walk back on to the hospital ward he left in a wheelchair just months ago. The 18-year-old was badly injured in a racing accident and was airlifted to the East Midlands Trauma Centre at Queen's Medical Centre in Nottingham where despite the best efforts of specialist teams he had to have both his legs amputated. He left the ward in May saying when he returned he'd be out of his wheelchair. He was good to his word when he came back to see staff and present them with a special thank you gift. 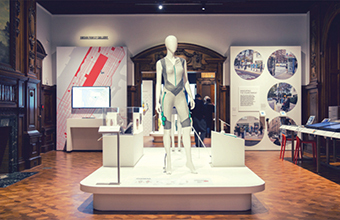 A UNIVERSITY of Dundee project that incorporates everyday materials in the design of prosthetic hands, to better suit disability, has gone on display at a prestigious New York museum. Hands of X, an initiative led by design researchers from Duncan of Jordanstone College of Art & Design (DJCAD) at the University of Dundee and University College London, design made-to-order prosthetics that come in a choice of materials including leather, woods, wools and metals. Their work will be on display in 'Access+Ability' at the Cooper Hewitt, Smithsonian Design Museum in New York until September 3. The hands are co-created by wearers and challenge the dominant prosthetic material palettes of 'realistic' skin-coloured silicone, cyborg-like carbon-fibre and 3D-printed plastics, offering a greater sense of ownership for users.